Do you want to grow plants healthily and consistently even when you are on vacation or away for a weekend? Do you want your Orchid to grow in a very specific and delicate condition without striking a blowing? Now, breeding plants and flowers is no longer a guessing game with our Plant Grow Light! Light is essential at every stage of development. If plants don't get enough light they become weak or even die. Even light emitted by windows may not be enough to the plant so the best solution is to grow them under LED grow lights even in summer. - A variety of flowering plants that include roses, chrysanthemum, peony, tulip etc. - All greens like tomatoes, chili, choy,herbs etc. - All succulents including ball cactus, burros tail,dudleya, ball cactus etc. 2.That's all! This plant light will auto turn off according to your setting time and auto turn on after 24 hours! 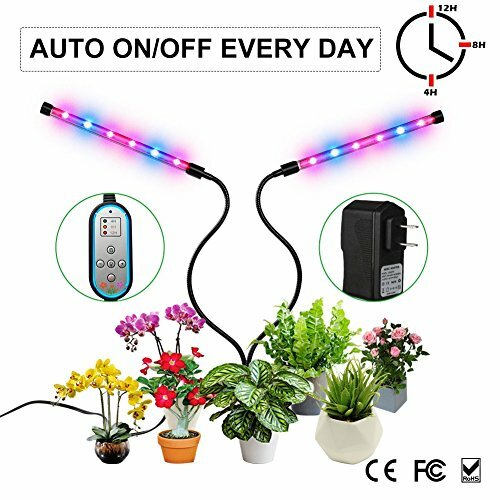 AUTO ON/OFF EVERY DAY with TWO-WAY TIMER - If you are looking for a plant grow lamp which is great and easy to use, look no further! Our grow light has patented two-way memory timing function, set up once and it will turn on and off automatically EVERY DAY! Let it takes care of your favorite plants even when you are on vacation or away for weekend! If you have any questions about this product by Melophy, contact us by completing and submitting the form below. If you are looking for a specif part number, please include it with your message.